I have personally worked with Avi a couple of times, and I can tell you he’s a genuine guy with a big heart, and a sharp mind for customer service. He doesn’t pressure you, he doesn’t wring you for every last nickel, and he wants to help you make a good moment great, and a great moment unforgettable. That’s why my favorite part of this episode is Avi talking about how he helps guys with their marriage proposals. He’s worked with probably thousands of guys as they propose to their partners, so he’s happy to coach them through what is one of the biggest moments of their lives. However, I wouldn’t be me if I didn’t want to dig into issues of controversy and offer the opportunity to my guests to offer insight and perhaps dispel myths about their industries. To that end, Avi and I talk extensively about blood diamonds (or, as is more common parlance in the jewelry industry – “conflict diamonds”) and how he responds to customer concerns about them. Further, we talk about the role of the industry in helping to attain fair labor practices across the world, particularly in developing countries where diamonds are the chief exported natural resources. All things considered, this episode has a little bit of everything. Whether we’re talking a bit about my own proposal story, Avi’s time buying diamonds in New York, why buying jewelry on the internet is probably not a good idea, or The Kimberley Process (a joint governments, industry and civil society initiative to stem the flow of conflict diamonds – rough diamonds used by rebel movements to finance wars against legitimate governments), there’s a ton of entertaining info on this week’s show. 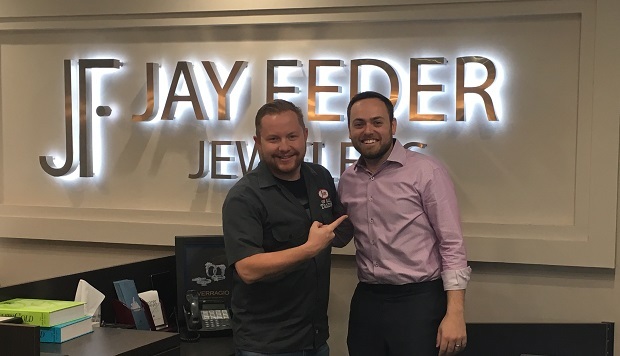 I highly recommend both Avi and Jay Feder Jewelers. You can find them on the web, on Facebook, on Twitter, or on Instagram. You can download this episode on iTunes, stream it on Stitcher, or listen at the Jon of All Trades homepage.